Lata Mangeshkar and her younger sister, Asha Bhosle, are legendary in the Hindi film industry. Their siblings Meena, Usha and Hridayanath, are not as well-known, but are acknowledged music powerhouses. Strangely, the younger Mangeshkars don't seem as keen to follow in the footsteps of their illustrious relatives. Lataji's niece, Radha Mangeshkar, is one of the few who have. 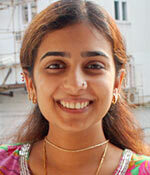 In fact, she has just released her Marathi album, Maza Naav Shami. Radha, who is the daughter of Lata's brother Hridayanath, is also said to be Lataji's favourite niece. On Lataji's 80th birthday, Radha talks to rediff.com about her aunt, who is also fondly known as the Nightingale of India. What is it like having such an iconic singer for an aunt? The best thing about this family is that we live in a joint family. When I was a child, she was a very busy singer. She would be out in the mornings and return late in the evenings. Still, we had our times together. It was a rule at home to have dinner together -- no matter how late somebody came in. We would go on family holidays during the summer. We were like any other family. The only difference is that other people go on vacations to shop while we would go on educational holidays. We would visit the historical monuments in Europe. All of us in the family are interested in history, culture and archeological sculptures. When you hear her sing, it's clear that she is an intelligent singer. She's just as intelligent when she speaks. She is also a very funny person and makes people roll on the floor with laughter. She has an amazing sense of humour. Whom did you learn music from? Did Lataji teach you? My father (taught me). These days, people have different gurus for different kinds of music like classical music or ghazals. I learnt only from my father in a very traditional way. There is a ceremony where you tie a sacred band around your wrist as respect for your guru. I have performed that for my guru, my father. As far as learning from Lata didi goes, if you listen to her songs, your second question is answered. All of us have learnt from her (through her songs). She has not taught me directly. Lataji is known to be a very shy person. Yes. She's very quiet. That seems to be hereditary. My dad is very quiet too. So am I, to a large extent. How does the family usually celebrate Lataji's birthdays? It's a very private family occasion. She doesn't want to meet or talk to anyone. Very few people can call her. She makes a conscious decision of not being in town on her birthday, just to avoid people. She usually makes it a point to go out of town for a week with us. Of course, like any other birthday celebration, we cut a cake for her at midnight. In the morning, we perform a pooja and aarti. What is your favourite Lataji song? All her songs are my favourites -- especially the ones she sang with Shanker-Jaikishen. Lataji isn't doing too many songs these days. She works very selectively. She's spending time with family. It's good to see this side of her. We have seen the times when she busy. Now, it's nice to see her resting at home. Can you tell us about your most memorable memory of Lataji? Since we live in a joint family, we spend the whole day together. So there are many memorable instances. For example, she is an excellent cook. She makes wonderful coriander mutton and gajar ka halwa. She is a quick cook. Have you joined her during her recordings? Yes, when she sings for my father. While recording, they are not brother and sister. He would teach her the tune. She would listen to it just once and pick it up. He will make his demands clear and she would share her opinion. I am too small to talk about her music. She just requires a couple of takes and is out of the recording room in no time. She is a perfectionist and always makes sure she has sung the song the way the director wants. Why has the next generation of Mangeshkars not taken to singing? It's not necessary that a singer's son or daughter should continue singing. People will have high expectations. My father is the Lata Mangeshkar of Marathi music. My brothers have trained in music but haven't taken it up as a profession. One of them is an artist and the other is a businessman. Were you pressurised to take on singing because of your heritage? My family did not. But people did. 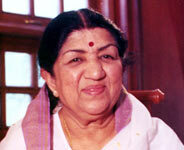 I know there cannot be another Lata Mangeshkar in the next 100 years or more. No one, including me, can reach her level.